My name is Meegen and I'm a married women with two little girls aged 4 and 6 and a baby boy. We live in a 4 bedroom house with huge garden in the whetstone. I have always loved children and always wanted to have a big family. I'm a caring and understanding, loving person. I love the outdoors and make sure that my girls play outside as much as possible. I'm a Ofsted registered childminder with three part-time assistants. Between us we have over 20 years experience. My reason for choosing to work with an assistant is so that I can provide a service that gives your baby/child the best care and start ever. All children will receive Tentative care in a homely yet educational setting. I understand exactly how hard it is to trust a childcare provider with your most precious gift/s in life. I treat every child with respect and value them all. I know each child is different and learns at their own pace and I will always encourage them. I just love seeing children grow from strength to strength in my care. I've made sure that my assistance share the same passion for children and have a steady on going career in childcare. We all have qualifications and loads of experience looking after children of all ages, races and personalities. We are all confident that we can provide an enabling environment where children can thrive. Our working hours are 8am - 6pm but I can be flexible if you need to drop your child off earlier or pick up later in the evening. This can all be agreed and I will accommodate your request if there's availability. I understand work life can be hard to think about in itself without having to worry about childcare. Full and Part-time spaces available. My fees are reasonable and I'm willing to discuss your requirements so please call. Included in our fees are food, snacks, drinks ,sun cream, calpol and local Playgroup. We have private activity groups that visit our setting weekly, these fees are excluding normal fees and will be discussed. Below are the latest reviews for Adorable Angels. Please note that reviews represent the subjective opinions of other Childcare.co.uk users and not of Childcare.co.uk. Parents must carry out their own checks and references on childcare providers to ensure that they are completely happy before enaging in the use of their services. I visited Meegan in her lovely setting when I was looking for childcare for my 1 year old son. Due to my partner’s revised working hours we ended up not being able to send him there in the end - which is a real shame. Meegan’s setting is big, bright, tidy and very welcoming. My son was happy there immediately when we visited. I found Meegan very well organised and full of all the information I needed. It all felt very professional. I will definitely contact Meegan again if we are looking for childminding in the future. Hi Amy, thanks ever so much for your kind words! All the best for you guys and hopefully we will cross paths in the future. My daughter has been with Meegen and her team for over 6 months now and she is extremely happy there. She is quite a clingy baby, so I was rather apprehensive about how well she would settle at first, but Meegen soon put my mind at rest. Meegen and her team were happy to deal with the bags of expressed milk that I would arrive with every morning and also ensured that my daughter was given a wonderful array of healthy foods and snacks as she was weaning which I'm sure has contributed to her being a great eater with a broad ranging palate. My daughter quickly made friends with the other children in Meegen's care and sleeps much longer there than she would ever nap at home, which indicates that she feels happy and secure. 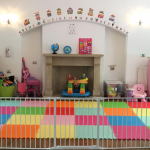 The facilities are excellent - the setting is a beautiful, big, spacious house which is wonderfully set out with plenty of toys and space for the little ones to roam around in. There is a lovely big garden too. Meegen organises lots of wonderful activities for the children to get involved in with playgroups, dancing groups etc. Meegen's assistants are all lovely, and have displayed genuine affection towards my little one which I have found quite moving! Additionally, when on the odd occasion my schedule has changed at work, Meegen has always been willing to try and accommodate changes to drop off and pick up times, and I really appreciate this flexibility. I feel very fortunate to have found such a great childminding service and I would highly recommend it without any hesitation. Thanks for a lovely review Sophia, We will miss you all dearly and so happy for you and the family. All the best with your new adventure! We are currently looking for a childminder and visited the facilities with our 15 month old. We were very impressed. The house is large, impeccable, bright, with lots of toys, plenty of staff and a gorgeous kitchen and garden. Megan is very organised and clear in her communication. In our subsequent communication she had a real can-do problem solving approach which as parents we really appreciate. Definitely a childcare provider worth considering if you live in the area. Thanks for your kind words and feedback. All the best for the future. Meegen's house is beautiful with lots of space for children to explore safely. Any child who gets to spend time there is incredibly lucky! Thanks for taking the time out to review our services Victoria! I have been with Meegen since my daughter was eight months and she absolutely loves it there. Meegen is very nurturing and caring and adapts to suit Alexis's needs. Alexis is always happy to go and I couldn't ask for a better environment. It is so local to me as well and she is always accommodating with my times. They have just moved premises recently and it is very spacious with a big garden. I am a first time mum so I know how hard it can be trying to find the best environment and I would highly reccommend Meegen. There are two other assistants as well who are fantastic and have loads of experience. Thanks for the review Shifali, Alexis is a joy to care for and we are so happy to have a great relationship with you and Fab.